“We are very grateful that China has organised this booth for us in just a few weeks’ time, because we have only confirmed joining after the official ties were made in August, Sigfrido Reyes, president of El Salvador’s export and investment promotion agency, said. Why this embrace from China? 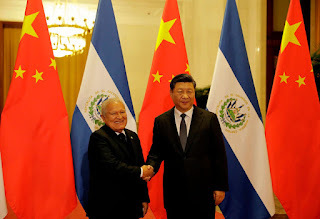 An article in The Week titled Why China is Wooing El Salvador, looks at the issue and offers the answer that China is trying to pull El Salvador and other Central American nations "into its orbit" of trade and political relations. But specifics are still hard to discern. Would a growing role for China have negative impacts for El Salvador? The Central American country certainly needs additional foreign sources of aid and investment, but China's aims are not altruistic. Beyond further diplomatic isolation of Taiwan as more Central American countries switch their recognition to the Peoples Republic, China is also looking to expand its influence to Latin America at a time when the US is focused on building a wall and reprimanding Nicaragua and Venezuela. In recent years, China has increased significantly its investment in African countries. Such aid comes with "no strings attached" so long as China gets access to African natural resources. A paper from the Council of Foreign Relations looks at the impact of China in Africa and finds that African countries are generally content with their relations with Beijing, perhaps because Beijing does not require them to clean up corrupt practices. Chinese firms operating in Africa are criticized for their environmental and labor practices. In contrast, it is not clear that there are any natural resources in El Salvador that China could be coveting. Nor does El Salvador have a significant voice on the world stage which China could be seeking to influence. Cheap Chinese goods already find their way into Salvadoran markets, so it is hard to imagine El Salvador as providing a major new source of sales for China. The current opening to China was started by a socialist FMLN president. Since the FMLN probably only has until May 1, 2019 to hold onto the executive branch, we could very well see the relationship shift after next year's presidential elections.